1. Place quinoa and water in a small saucepan over medium heat and bring to the boil. Reduce heat to a simmer, cover and cook for 15 minutes, or until quinoa absorbs water. Transfer to a large serving bowl. 2. 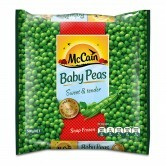 Place McCain Baby Peas, shallots, tomatoes, mint leaves and baby salad leaves into a bowl with the quinoa and fold through to combine well. Season with salt and pepper to taste, and dress with the juice of ¾ of the lemon and garlic infused olive oil. 3. Meanwhile, slice halloumi into approximately 5mm thick pieces. Heat olive oil in a small non-stick frying pan over high heat and sauté haloumi with the remaining lemon juice for 1-2 minutes on each side, or until golden. Remove from pan and serve immediately over quinoa salad mixture. 1 Place quinoa and water in a small saucepan over medium heat and bring to the boil. Reduce heat to a simmer, cover and cook for 15 minutes, or until quinoa absorbs water. Transfer to a large serving bowl. 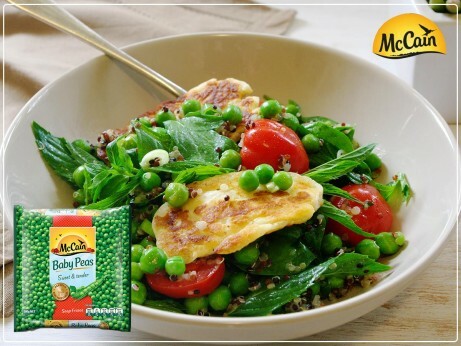 2 Place McCain Baby Peas, shallots, tomatoes, mint leaves and baby salad leaves into a bowl with the quinoa and fold through to combine well. Season with salt and pepper to taste, and dress with the juice of ¾ of the lemon and garlic infused olive oil. 3 Meanwhile, slice halloumi into approximately 5mm thick pieces. Heat olive oil in a small non-stick frying pan over high heat and sauté haloumi with the remaining lemon juice for 1-2 minutes on each side, or until golden. Remove from pan and serve immediately over quinoa salad mixture.